Fresh on the market: a beautiful two story single family home by Heritage Custom Homes, the Lexington-based residential builder known for its excellent quality craftsmanship. This gorgeous new home (2,550 sq. ft., priced at $437,900), is located on 170 Glade Spring Drive in the heart of Saluda River Club’s Village District. The home includes 3 generous bedrooms, including the master suite on the main floor, and 3.5 baths. There is also a large, 2.5 garage on the back of the home, suitable to house two cars as well as a golf cart, kayak or bikes. The covered porch leads up to the main door of the home. 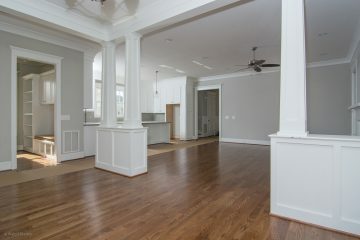 When entering the home, you are immediately impressed with the elegant open floor plan, accentuated with columns, crown molding and a lot of natural light. Hardwood floors throughout the first floor create a beautiful, unified feel to the home. The kitchen is a chef’s delight, with a well-thought out layout and a huge granite-topped island that is perfect for entertaining – as well as doing homework while dinner is getting underway. Beautiful tilework and a connected mudroom / pantry area make this the kitchen of your dreams. The kitchen opens into the large family room with a large fireplace and creative build-ins that help separate the living room from the dining room. The entire space is flooded with natural light through large windows. The master suite with connecting master bath is designed for today’s discerning homeowners. In the master bath, a granite-topped double vanity is just one of the must-haves in this spa-like retreat, with its large garden tub and beautifully tiled rain shower. Homeowners will be able to take advantage of South Carolina’s mild climate almost year-round. This home has a large covered outdoor deck with a stunning, natural stone fire place – great for parties, watching sports or just relaxing with a cool glass of lemonade. This is Carolina living! 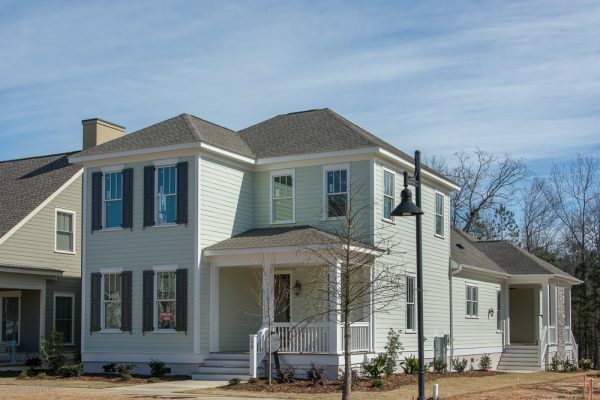 To learn more about this fine new home by Heritage Custom Homes and other brand new homes that currently available at Saluda River Club, please schedule a visit soon. For more information or directions, please call 803-358-3969 or visit www.saludariverclub.com.